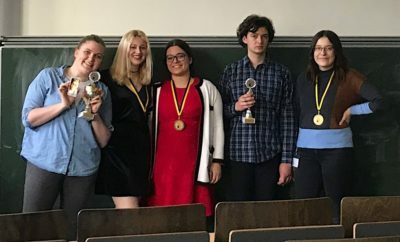 In a final jugded by Aisling Tully (chair), Huyen Nguyen, Matt Hankin, Przemek Stolarski, Miri Muntean, Joona Suhonen and Seyoung Jeon, the team Trauma All-Stars (Dawid Bartkowiak, Lucy Murphy) in Closing Government won the Munich Research Open 2019 against teams Bonaparte Zeno & Marike (Marike Breed, Zeno Glastra van Loon) in Opening Government, Oxford BS (Jack Solomon, Louisa Broeg) in Opening Opposition and Cyanide and Happiness (Tin Puljić, Olja Bošnjak) in Closing Opposition. They debated the motion “THBT female political candidates in liberal democracies should not appeal to traditional female roles in their campaigns”. The Novice Final on the motion “TH regrets the idealisation of motherhood” was won by Competition in economics is overrated (Marina Kojić, Mira Eberdorfer) in Closing Government against the Opening Government Munich’s Last Stand (Linus Kienmoser, Marc Richly), Opening Opposition TEAM ROCKET (Tara Jović, Matko Dujmović) and Closing Opposition Dreams breakers (Antoine Veniant, Michał Kowalski). This final was judged by Huyen Nguyen (chair) with Calyxx Peucker, Klaudia Maciejewska, Matt Hankin and Katharina Jansen. Best speaker was Tin Puljić with an average of 82 points, the best novice speaker was Louisa Broeg, averaging 79.4 points. Different from previous editions of the tournament, the Munich Research Open 2019 also represented the platform for a scientific study conducted by researchers from the Ludwig Maximilian University of Munich. Right before and right after each round, the scientists would distribute surveys with factual questions related to the motion to debaters and would ask judges to fill in a second ballot assessing the overall persuasiveness of each speaker (including style). Once first results are available, the researchers announced they would distribute them via the convenor to the participants. Aisling Tully, Anna Neuber, Calyxx Peucker, Huyen Nguyen, Jan-Gunther Gosselke, Joona Suhonen, Katharina Jansen, Klaudia Maciejewska, Liv Rutkowska, Markus Myllymäki, Matt Hankin, Milla Huuskonen, Miri Muntean, Przemek Stolarski and Seyoung Jeon. 1. Bonaparte Zeno & Marike (Marike Breed, Zeno Glastra van Loon) – 13 | 802 spks. 2. Cyanide & Happiness (Tin Puljić, Olja Bošnjak) – 12 | 799 spks. 3. Oxford BS (Jack Solomon, Louisa Broeg) – 12 | 798 spks. 4. West coasting into your DMs (Braedon Lehman, James Ashwell) – 12 | 786 spks. 5. Trauma All-Stars (Dawid Bartkowiak, Lucy Murphy) – 11 | 791 spks. 6. Break or gulag (Dimitri Nilov, Anastasia Vovk) – 11 | 779 spks. 7. Africans Colonising Europe (Paidamwoyo Mangondo, Jacques Malherbe) – 11 | 777 spks. 8. Dirty Breaking (Krzysztof Kropidłowski, Adam Drożyński) – 10 | 777 spks. 1. Competition in economics is overrated (Marina Kojić, Mira Eberdorfer) – 8 | 768 spks. 2. Dreams breakers (Antoine Veniant, Michał Kowalski) – 8 | 737 spks. 3. Munich’s Last Stand (Linus Kienmoser, Marc Richly) – 8 | 731 spks. 4. TEAM ROCKET (Tara Jović, Matko Dujmović) – 8 | 723 spks. The CA panel consisted of Aisling Tully, Matt Hankin, Milla Huuskonen and Miri Muntean. Uzair Tajuddin tabbed the tournament while Yimin Ge convened it. SF: Infoslide: For the purposes of this debate, you are an out gay/lesbian individual in a Western liberal democracy.